PennsylvAsia: Kurosawa film High and Low (天国と地獄) at Melwood Screening Room, May 27. Kurosawa film High and Low (天国と地獄) at Melwood Screening Room, May 27. 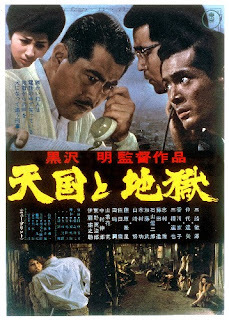 Adapted from a novel by American pulp writer Ed McBain (whose real name is Evan Hunter), 1963's High And Low stars Toshiro Mifune (naturally) as a properous, principled shoe-company executive. On the verge of taking over the company from a group of less ethical co-workers, Mifune learns that a kidnapper demanding a financially ruinous amount of money has his son. When it's discovered that the kidnapper has mistakenly taken the son of Mifune's loyal chauffeur, Mifune is faced with a dilemma that tests his selflessness. The show starts at 8:00, and the theater is located at 477 Melwood Ave. in Oakland (map). Part of the Essential Cinema series, tickets are $2.